CAE Healthcare has secured the rights to distribute in the United States, a medical simulation trauma surgical suit developed by Strategic Operations Inc. (STOPS). 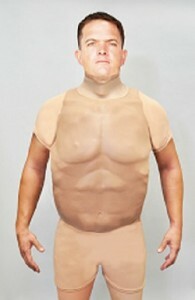 The STOPS Surgical Cut Suit is basically a synthetic vest that can be worn by a person or manikin. A pump inside the suit regulates the pressure of a fluid to simulate hemorrhaging when a person’s skin is cut or punctured. The suit was designed to enable first responders to practice surgical and emergency procedures in a more realistic manner. Other procedures include hemorrhage control by tourniquet or by suturing and stapling or internal organs, arterial ligation or clamping, surgical cricothyrotomy, needle thoracentesis, suturing of internal organs and skin, and peripheral IV access. The suit can also be customized based on the scenario being practiced. The suit is also repairable for multiple uses. Cut Suit Video from Strategic Operations on Vimeo. The San Diego, Calif-based STOPS provides what it calls Hyper Realistic training services and products for military, law enforcement, and other organizations. STOPS Tactical Training Canada LLC is headquartered in Alberta and a subsidiary of STOPS. STOPS is selling the cut suit to the Canadian and U.S. military services, according to Kit Lavell, executive vice-president of STOPS. According to Lavell, the suit is available in two version. One version is the EMS Tactical Combat Casualty Care suit which is designed specifically for TCCC training. This suit is designed to provide realistic training for non-medical in handling typical battlefield injuries. This suit sells around the US$36,000/unit range. A more complex version designed for surgical training cost anywhere from $69,000 to $75,000/unit. Both suits are user-repairable so that customers can reuse them and save money. In September last year, the Montreal-based CAE Healthcare obtained exclusive rights to distribute the STOPS Surgical Cut Suit and other simulation training products in all parts of the world outside the United States. The most recent agreements expand this distribution agreement. Nestor Arellano is editor of Vanguard Magazine. Nestor is a seasoned journalist who has written extensively on defence and military industry issues as well as technology and business developments. He is also associate editor of Vanguard's sister publication, IT in Canada.